Categories: Health, Doctors, Medical Advice, Advice, Nea. One of the fundamentals of good health is good information. And with so much information now available online, on Facebook and on the evening news, it can be confusing to know whom you can trust to answer essential medical questions. 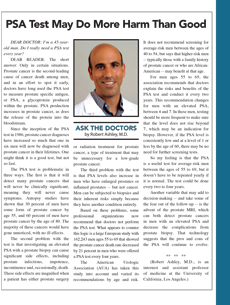 If you aren't sure whom to ask, know that you can always "Ask the Doctors." 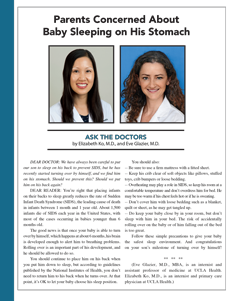 This new question-and-answer column is written by three enthusiastic young internists who will address readers' most pressing medical inquiries six days a week. Drs. 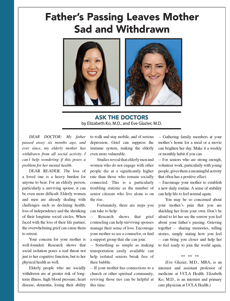 Robert Ashley, Eve Glazier and Elizabeth Ko will give readers the same thoughtful analysis that they give their patients every day. The topics discussed will include everything from current health trends to personal medical opinions. 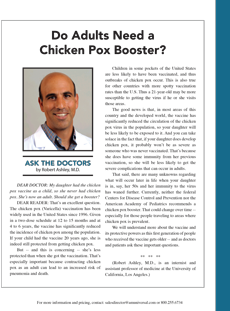 All three doctors are affiliated with UCLA Health and its hospitals and clinics; Drs. Ashley and Glazier also teach at the UCLA School of Medicine. She is also the medical director of UCLA Entertainment Health, where she oversees UCLA’s Motion Picture Television Fund Health Centers.